Diets are based on the unspoken fear that you are a madwoman, a food terrorist, a lunatic. The promise of a diet is not only that you will have a different body; it is that in having a different body, you will have a different life. If you hate yourself enough, you will love yourself. If you torture yourself enough, you will become a peaceful, relaxed human being. Although the very notion that hatred leads to love and that torture leads to relaxation is absolutely insane, we hypnotize ourselves into believing that the end justifies the means. We treat ourselves and the rest of the world as if deprivation, punishment, and shame lead to change. We treat our bodies as if they are the enemy and the only acceptable outcome is annihilation. Our deeply ingrained belief is that hatred and torture work. And although I've never met anyone—not one person—for whom warring with their bodies led to long-lasting change, we continue to believe that with a little more self-disgust, we'll prevail. But the truth is that kindness, not hatred, is the answer. The shape of your body obeys the shape of your beliefs about love, value, and possibility. To change your body, you must first understand that which is shaping it. Not fight it. Not force it. Not deprive it. Not shame it. Not do anything but accept and—yes, Virginia—understand it. Because if you force and deprive and shame yourself into being thin, you end up a deprived, shamed, fearful person who will also be thin for ten minutes. When you abuse yourself (by taunting or threatening yourself), you become a bruised human being no matter how much you weigh. When you demonize yourself, when you pit one part of you against another—your ironclad will against your bottomless hunger—you end up feeling split and crazed and afraid that the part you locked away will, when you are least prepared, take over and ruin your life. Losing weight on any program in which you tell yourself that left to your real impulses you would devour the universe is like building a skyscraper on sand: Without a foundation, the new structure collapses. Change, if it is to be long-lasting, must occur on the unseen levels first. With understanding, inquiry, openness. With the realization that you eat the way you do for lifesaving reasons. I tell my retreat students that there are always exquisitely good reasons why they turn to food. Can you imagine how your life would have been different if each time you were feeling sad or angry as a kid, an adult said to you, "Come here, sweetheart, tell me all about it"? If when you were overcome with grief at your best friend's rejection, someone said to you, "Oh, darling, tell me more. Tell me where you feel those feelings. Tell me how your belly feels, your chest. I want to know every little thing. I'm here to listen to you, hold you, be with you." All any feeling wants is to be welcomed with tenderness. It wants room to unfold. It wants to relax and tell its story. It wants to dissolve like a thousand writhing snakes that with a flick of kindness become harmless strands of rope. Treat yourself with exquisite kindness and join me today. I really, really needed these words today. Right now I’m sitting on a train between Malmö and Lund ( Sweden ) feeling down right hopeless. My knees are broken because of all this weight I’m carrying around and I feel so….. dirty and BAD. Why, oh, why can’t I listen to and comfort the little one inside of me? Why do I feel that if I do, I’d break into a thousand pieces? Thank you again. I’m not giving up. Beautifully said..,love the snake metaphor? Wow this is powerful and timely. I have struggled with shame and have been overweight most of my life. But God has been healing broken places in my life and He healed me of the shame (long story) and slowly but surely, like a ship turning in the sea, I started to lose weight. It has been a long and sometimes difficult journey. And I have documented it all on my Facebook page because if I didn’t hide from it, and shared it, I knew God would bless me and use it to help others with the same struggle. I once weighed 350#. I had bariatric surgery In Dec 2014 and I weighed 281 at that point. My most recent weight is 212#. It has made a huge difference in my health and my life. It is kind of like God said to me “Here is your life back”. I could hardly walk, my diabetes was out of control, you get the picture. Now I can walk, go up steps and getting Better everyday. I have had some Of the same struggles I had before the surgery…fighting the cravings, tracking my calories, etc. bit it has been an awesome journey. So thank you for sharing this! Your words never get old. No matter how many times I read or listen to your stories, they always resonate, always enlighten,,always inspire,,,thank you. Thank you for this wonderful wisdom on Labor Day Weekend which is the classic “Let’s diet again” time for me. Every word resonates. Every word. Thank you for the conscious interruption and the chance to begin again. With love. And with kindness and respect. I need the reminder that the food has served a purpose and that other purposeful behavior can only come with compassion. Your words hit me like a ton of bricks. My daughter and I are at odds . . . and anger and sadness are my constant companions. Maybe we have both been wronged and we have both wronged each other. But it feels like I’m being ground into the dirt and left to die, exposed, bloody and broken. This is my child, . . . the baby I carried and birthed and raised alone . . . who appears to hate me and believes she was abandoned. How could I ever abandon her . . . doesn’t she know that a mother does many things to appease other people but would not abandon a child she carried within her body for all those days and nights? I reach out, asking for her forgiveness but find only a blank wall . . . an empty room. Today, I will not turn to food for my comfort. There is another way . . . another path to choose. In spite of my anger and sadness, I WILL love myself today. How can it be I am so fascinated with your work, yet something holds me back? Excuses but that’s all they’d be… Excuses. If I would say something today, with a huge emotion in my heart, it is thanks a lot, dear Geneen.Because you speak every single time to my story, to me feelings, to my broken heart, to my fears, to my endless fight with myself and with food, to my body and to my beliefs. God bless your kindness that heals up so many broken hearts all over the world.Love you! Thank you, and kindness is a huge part of the journey and success! Thank you so very much. How very thankful I found your books and tapes. These make more sense and touch the heart in too ways to list here. Yes, kindness is a huge part of the journey with insight, understanding, with peaceful success. I have gained weight since my retreat. I was so hoping I could get to the kindness I needed to make the better choices that would help me not keep using food…I still feel desperate and wonder how I can make this work for me. For me the eating I do to run from anxiety is a doorway into awareness. Anxiety eating, the fallout from it, has prompted me in the past to make fantastic changes like going to University, for the first time, when I was 40. But. I had a scary few years during the recession. Deaths, redundancy, health, financial loss. Anxiety is ever present. This year I have had the most work I’ve had since 2008. I thought having a more stable income would reduce the anxiety, but it’s worse. At work I feel resourceless. I think this is because I work really hard to make up for the lean years and go over board with effort. I come home exhausted and that triggers the anxiety and I choose to isolate and eat. I have hoped to find others here in NZ to listen to the online retreat with, etc. To do this work alone is impossible. I do have a lot of self awareness around the way I eat. Mostly I eat to punish myself, to be mean. It’s not comforting. And it’s a bit scary looking at that. If there is anyway to put people in contact with each other in their home countries that would be great. I just want to say how impressed I am with all the people commenting: so open and honest (yes, raw), and that helps me be more honest with myself. Thank you for taking the time to share such personal feelings. I’m not even sure how to start writing this except to say thank you. I am 23 years old, and recently diagnosed with Bipolar disorder. I have been struggling with eating for a few years now, binging and excusing it by restricting myself for a few days afterward. I had never wanted to link these two things- yes I have BPD but the eating is just me being careful, “watching my weight.” Your books helped me to understand how connected it all really is- an abusive father I walked on eggshells around is similar to walking around my highs and lows. The way I “control” what I eat is similar to controlling my emotions around my controlling mother. If I am able to financially, I will be at the retreat in the spring because you have been the ONLY person so far (who I have found) that writes about the things we all try to hide but shouldn’t. I have and will continue to recommend your writings to those who could use the help. 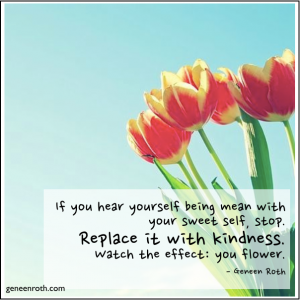 Dear Geneen, I want to dear thank YOU for posting these interesting articles that remind me that KINDNESS is better than MEANNESS, and being hard and pushy with my weight, with my body and with my whole self. I am learing, slowly to be kinder with myself and to accept my body and weight, now, in this very moment.I go back and forth between being kind, sometimes, and being mean and hard and bad with myself again…Old patterns dye hard, don’t they? Anyway, thank you so very much for giving us all so much inspiration, motivation and love.